Back again with yet another wonderful collection of gift suggestions for the festive season (see Part 1 here). 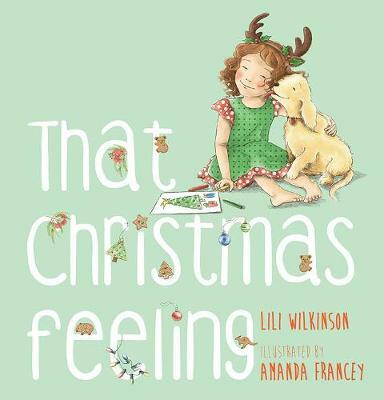 This time, a few picture books perfectly gorgeous for preschool children who will love the buzz, love and tingle that feels like Christmas. Merry Everything! is an utterly joyous celebration packaged in a magical wrapping of scrumptious words and pictures to create all kinds of warm and fuzzies. Naturally! It’s by one of my favourite creative combinations; Tania McCartney and Jess Racklyeft! 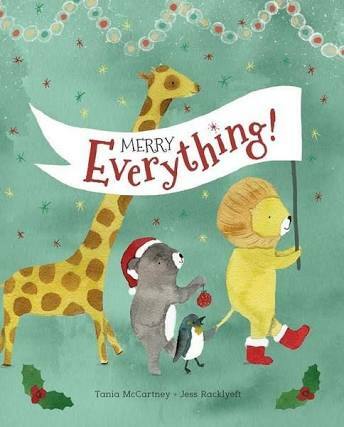 A book about inclusion and togetherness at Christmas time – what better way to introduce this global jollification than with the endpapers adorned with addressed letters to different animal families around the world. The story continues with sentiments so lovingly expressed through Tania’s kind of lyrical prose about all the preparations pertained to the common link that is Christmas. Bees buzz with busy, pandas wrap surprises, monkeys hang lashings, whilst penguins string songs on the starry sky. Appropriate atmospheric and seasonal scenes and habitats are beautifully thought out in Jess’s sugary sweet watercolour illustrations. Her paintings dazzlingly feature a medley of winsome critters and creatures so busily assembling the festivities with their families. And “on Christmas Day, the world tingles with happy.” Tania’s text continues to bring joy with her mix of cheerful verbs and rhyming elements, humour and bursts of emotion, just like full tummies at the end of a jubilantly hectic day. A universally appealing book that is brimming with love and intimacy, warmth and unconditional happiness, Merry Everything! is everything a young reader could wish for this Christmas. Windy Hollow Books, October 2017. That Christmas Feeling is another heartwarming tale by Lili Wilkinson and Amanda Francey that has us craving that aura of magic and excitement in the lead up to the big day. But how do you define ‘that Christmas feeling’? Is it baking the Christmas pudding, decorating the tree as a family, singing carols or visiting ‘Santa’? Dottie, Jem and their pup Shortbread reminisce about their special moments last year as they await the arrival of Mum and Dad at their grandparents’ house. This year is not quite the same, and for some children this may be a reality where compromises and adapting to change need to be made. In a bid to find the feeling they so long for, Jem shows Dottie a tree with twinkling lights and they sing songs together. Then Mum and Dad join them with a delivery that qualifies as the most precious ‘Christmas feeling’. It will literally give you shivers! Touching and packed with emotion, and detailed illustrations that are equally full of life, reflection and charm, That Christmas Feeling is a tribute to the significance of family love and balancing expectations in times of uncertainty or change. Preschoolers will be overcome with hearts filled with joy after sharing this gorgeous book. Allen & Unwin, September 2017. What a joyous story brimming with sunshine and optimism, friendship and generosity! A Very Quacky Christmas by Frances Watts is delightfully cheerful with stunning illustrations by Ann James, perfect for reflecting on the true spirit of a bright Christmas. Samantha Duck gloriously sings, “We wish you a quacky Christmas” whilst winding tinsel around reeds, hanging baubles and stockings on branches, and writing wish lists for all her friends. In the meantime, by her side is the pessimistic tortoise, Sebastian, certain that Christmas is not for animals. But, despite his scepticism he agrees to help his friend collect precious items from animals around the farm – sharing in a Christmas for animals is a delightful idea, after all. A cart full of presents and a bumpy ride later, who else shows his support, encouragement and nobility but Sebastian himself! 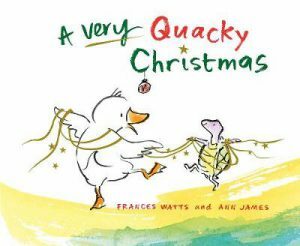 A Very Quacky Christmas is an absolutely feel-good book about giving and sharing, with its provocative text and effortless, dreamy illustrations that allow the golden effervescence to wash over the pages and into your heart. Love. ABC Books, HarperCollins, October 2017. Here’s a gift that keeps on giving – the legendary classic, We’re Going on a Bear Hunt (Michael Rosen and Helen Oxenbury), specifically designed as a gift book with an all-encompassing snowglobe inset into the cover. Follow your journey through the long wavy grass, deep cold river, oozy mud, dark forest, and into a swirling whirling snowstorm as you shake and swish the book to create a ‘cool’ whooshing, kinaesthetic experience. What a blast! Continue on your suspenseful way to the narrow gloomy cave, and rush back home again with bear-on-tail, right into the comfort of your bed. A masterful gift idea from the people at Walker Books to allow us oldies to relive the drama and excitement, and for the youngsters to be inspired to engage in all the songs, actions, role plays and good old cuddles that accompany this favourite treasure. 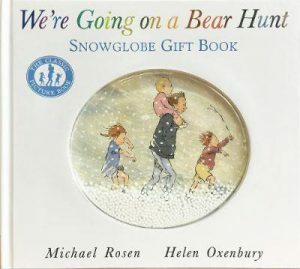 Designed to captivate our hearts with some interactive fun, We’re Going on Bear Hunt Snowglobe Gift Book will be a winner for preschoolers this Christmas.